Southern Italian cooking, old-world charm and a little bocce ball distinguish this family-owned restaurant. 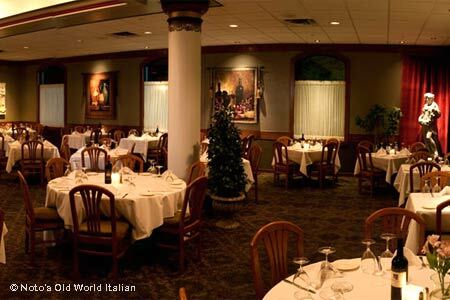 : Dark wood furniture, white linens and fresh-cut flowers fill this attractive dining space, where the Noto family personalizes the southern Italian menu with their own special flair. Pasta entrées are delicately seasoned. Among second course dishes, choose from pan-roasted salmon with fresh orange-and-thyme sauce; breaded chicken breast with ammoglio; and homemade gnocchi with the chef's sauce of the day. Knowledgeable staff will direct you to just the right wine choice from a list dominated by Italian varietals. If you haven't overeaten, check out the bocce ball courts just outside the restaurant.